The year is drawing to a close, but the chapter hasn’t ended quite yet on hunting. If you still have a tag left in your pocket, it’s not going to fill itself. 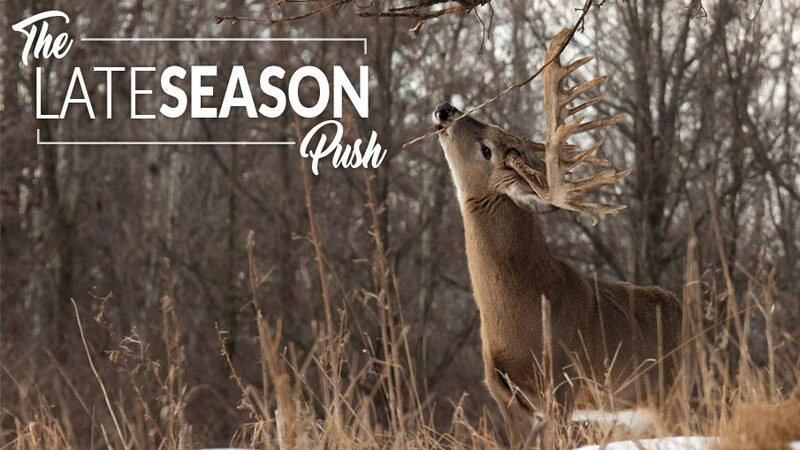 So, tune in to The Revolution this week as we seek out a panel of experts with late season hunting tips and knowledge to help you clench the win and end this season on a successful note. Learn how to navigate the changing patterns of wild game, diverse weather conditions, late season strategies, and so much more! Joining us will be Curt Wells, Editor of Bowhunter Magazine and co-host of Bowhunter TV, Ty Sjodin of the all-new The Ontario Experience on Sportsman Channel and finally, CatDaddy. The Revolution is presented by Outdoor Channel, Sportsman Channel, World Fishing Network and MyOutdoorTV. As hunting seasons wane, a change in strategy is almost certainly required if you want to fill the tag that is burning a hole in your pocket. Animals are on edge right now, after months of hunting pressure, so you need a solid plan. Curt Wells, co-host of Bowhunter TV on Sportsman Channel and the Editor of Bowhunter Magazine, joins The Revolution and says that extended sits in the woods aren’t as effective this time of year so he’ll talk patterns, and explain the most advantageous point to ambush deer, as they travel between bedding and feeding areas. He’ll also pinpoint highly attractive food sources to set your sights on and explain why and how your effective shooting range might change during cooler months. Finally, he'll talk about a Yukon moose hunt, years in the making, and how he found success and connected with a bull on the 8th attempt. Tune in for this special two-part interview with Curt Wells and see what’s in store for upcoming episodes of Bowhunter TV. Ontario is a sportsman’s paradise that delivers world class hunting and fishing opportunities. Beginning January 2018, you can explore the vast wilderness of Ontario with Ty Sjodin and Troy Lindner as they host the new show, The Ontario Experience on Sportsman Channel. Ty joins The Revolution this week with a look at the new show. He’ll highlight the plentiful fishing opportunities that this region has to offer. While he is an avid fisherman, Ty says that whitetail hunting is enough to get him out of the boat and into the woods in the fall. He says that Ontario also offers great moose, black bear and grouse hunting, as well. He tells Jim and Trav, that this will be more than just a hunting and fishing show, but will also put a spotlight on lodges, guides, historical and geographical curiosities, food and so much more. Find out more about The Ontario Experience and Ty Sjodin, this week on The Revolution. While cold water might stifle the activity of some catfish species, winter tends to be one of the best times of the year to catch blue catfish. CatDaddy joins The Revolution this week to talk strategy and explain how to land some of these frisky blues. He tells Jim and Trav that the blue catfish are hungry right now and when presented with the right bait, the action can be fantastic. So, what is the right bait? CatDaddy says that fresh crappie heads are hot right now and taking the time to catch fresh bait is rewarding him with aggressive hits. When it comes to locating them, he tells Jim and Trav that he is drifting along rocky ledges in 50 feet of water, pinpointing large rocks in an effort to draw out blue catfish. Tune in for detailed tips on how to catch your own Christmas blue cats and also find out how to book a trip with the catfishing guru, himself, CatDaddy.